Big Finish: Doctor Who - THE DIARY OF RIVER SONG Series One Review | Warped Factor - Words in the Key of Geek. Tony makes a date with River. Ultimately, swipes left. It’s important to understand one thing: I am by no means one of the internet’s rabid he-man River-haters. Written well, she was a great experimental character, with a unique perspective on the Doctor. Yet her inclusion in 2015’s Christmas Who left me strangely cold. Perhaps, I thought, the Big Finish River would be a better essay on essentially the same subject – what does River get upto when the Doctor’s not around to take centre stage. The Diary of River Song is absolutely, beyond a shadow of a doubt, that and more. Written by three old Big Finish hands (Justin Richards, James Goss and Matt Fitton) and a newbie to the format, the wildly-successful-in-her-own-right Jenny T Colgan, the episodes of this box set give a rich peek into the life of River Song as the star of her own life. The linkages between each of the episodes (and there are some – the box set is essentially one story in four very different tonal blocks) feel a little clunky and could leave you with a sense of “Wait – what just happened?” And sides of River’s personality seen only rarely on-screen are expanded, so you get a better sense of knowing her than you’ve ever had before. In some ways though, that’s the biggest issue with this foray into New Who adventures on Big Finish audio – sometimes knowing more does not equate to liking more. The problem surfaces in the first story, Colgan’s The Boundless Sea. While Colgan delivers a polished story that’s half Indiana Jones, half Stargate, with sealed tombs, people who refuse to die, sweat-vampires and mysterious robo-insects that facilitate a hellish immortality (it’s a cheerful one, you can probably tell), and it’s good to hear River actually doing some archaeology again, the problem of River’s personality rather grinds the gears of the whole thing. There’s a sense of River very much feeling like the star of her own life, always striving to say the arch thing, the unpredictable thing, as if with a cheeky wink into camera two. Add that to Alex Kingston’s relative unfamiliarity with the audio format, and what you get has a tendency to feel a little cheesy, like a laugh-tracked sit-com. Having been through the whole box set a few times, we can definitively say the problem there is not in Colgan’s writing – with a more naturalistic delivery, The Boundless Sea could have been both creepy and funny. As it stands though, it develops a kind of impatience in the listener, though the escalation of the sweat-zombie threat is effectively delivered and the solution is agreeably…messy. Justin Richards’ I Went To A Marvellous Party, whether intentionally or not, bears a very strong resemblance to the mid-section of 2015’s Who Christmas Special – River, invited to a big party in space with the decadent, the deviant and the psychotically deranged. This time though, the psychotic derangement shows itself through the manipulation of planets, their histories, economies, societies and the like. For all those who think the world we know is secretly run by a shadowy cabal of string-pullers like the Koch brothers or the Bilderberg Group, Richards has a fun development – whole star systems run by the same kind of elite, for their own ultimate benefit, rather than that of the people of the planets. Richards also delivers far more internal drama, with a kind of Agatha Christie-style murder mystery among the charming psychos, and the mystery of a kind of anti-Doctor figure who takes ‘companions’ from the planets they control, patronises them for a while, then wipes their memories and puts them back. As people keep telling River that her husband is there and looking for her, there’s a good bit of tension developed as to whether this description could be seen to fit the Doctor, but for most of the episode, it’s a case of companions together sticking it to the arrogant, planet-running numbskulls, and given a more alien challenge, Kingston tones down the delivery and we get a more Sixth Doctorish version of River, investigating the deaths and fixing the bad guys, which allows I Went To A Marvellous Party to be significantly more diverting than the first episode. Now, an admission. There are two other Doctors in this box set. Paul McGann as the Eighth Doctor turns up in episode four, but sadly, almost disloyally, we have to admit that Kingston’s River Song works much better with the version of the character she meets at the end of episode two, and who’s her companion all the way through episode three. Whenever the lists of ‘Who should be the next Doctor?’ come out, one name that seems almost allergic to appearing is Samuel West. There are probably good solid reasons for that, but his interpretation of ‘Mr Song’ in episode three is a thing that is enthralling and endearing, in the league of David Morrisey’s Jackson Lake or John Hurt’s War Doctor. He’ll undoubtedly be a one-episode Doctor, but West is great in the role, and – perhaps because it’s more familiar to her to be acting alongside a Doctor, Kingston shines in this episode, Signs by James Goss. Of the four, it’s by far the most comfortable listen, the back-and-forth between the Doctor and River eating up running time with a spoon, as a fatal dose of radiation tries to kill Professor Song, and the two go hunting for SporeShips – a kind of ancient, sudden death-bomb which appears out of nowhere, kills all life on a planet and then lets nature take its course rewriting the natural history of the world. The last third of this story is heartbreaking too, meaning that of the four, episode three feels the most emotionally complete and satisfying. The Rulers of the Universe, by Matt Fitton, closes out this first series of The Diary of River Song, with that extra special treat – River working with a Doctor we know about, but who she hasn’t met yet. 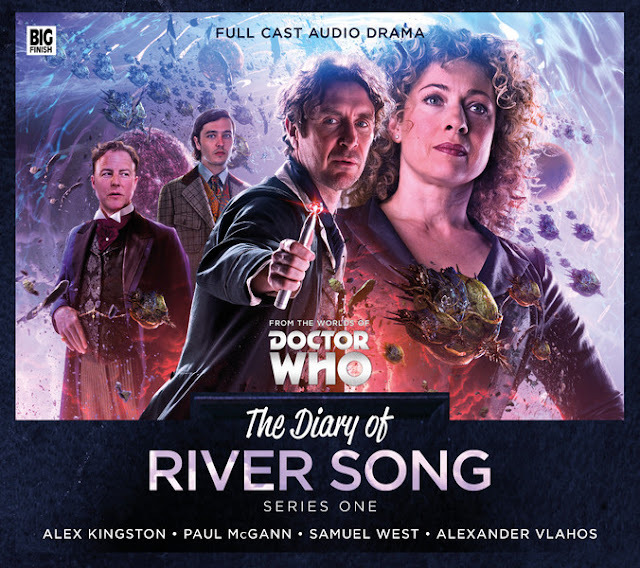 This one’s interesting, but a little overcomplicated for casual listening – River does A Thing which gets distinctly ‘timey-wimey,’ meaning you have to keep score and count, and you might want to borrow a friend if you’re using your fingers. Excitingly, this is an Eighth Doctor during the Time War that he’s still trying very hard to ignore, or at least not to get wholly involved in, but there’s a corresponding disappointment when it turns out that, as is actually perfectly logical, ‘there are rules’ about River playing with earlier Doctors. That makes perfect sense inasmuch as the Tenth Doctor didn’t know who she was when he first met her in the Library, but it also rather weakens River’s semi-mythic status – she keeps pictures of all the Doctor’s earlier faces, but given that she didn’t recognise the Twelfth Doctor in The Husbands of River Song, it means she’s only really allowed to play with one and a half Doctors – some of Ten, all of Eleven – and it seems now as though her involvement with future has been curtailed by the timeline coming full circle from her point of view on-screen. The woman who killed the Doctor, and the Doctor’s wife, feels diminished in stature by the need to creep around what she rather beautifully calls the ‘ingenue’ Eighth Doctor, even if she’s increased again by the way she deals with the self-appointed rulers of the universe. Overall, Series 1 of The Diary of River Song is…OK. Is it one you absolutely need to listen to? Only in the circumstances that you’re a rabid River fan. There’s some serious acting talent spread across the four stories, with Alexander Vlahos (better known to Big Finishers as Dorian Grey), Alexander Siddig (most famous as Dr Bashir on Star Trek: DS9), Imogen Stubbs, known for her classical clout (especially as Desdemona opposite Ian McKellen in Othello), and Samuel West (known for all sorts of things, including recently Jonathan Strange and Mr Norrell, but back on TV screens in January in Mr Selfridge) heading the talent pool surrounding Alex Kingston in her first Big Finish audios. And when the territory is more familiar, Kingston sinks into Rivering in the new medium well enough. But ultimately, there’s an entirely unfair but unavoidable comparison that intrudes. There has of course been a time-travelling archaeologist with a line in witty repartee and a habit of bumping into the Doctor in Big Finish audios for years now, and Lisa Bowerman has nailed Bernice Summerfield indelibly into our consciousness over those years. That leaves Kingston little in the way of wriggle room to establish the need for River to exist in the same domain, and her unique selling point – being the Doctor’s wife – doesn’t do enough here to establish that need. If you’re a rabid River fan, rejoice! She of the spoilers and the sonic trowel now exists in audio. If not, buy the Bennie box-sets instead. You’ll have heaps more fun with less of the relationship baggage.